National Volunteer Week, April 6–12, 2014, is about inspiring, recognizing and encouraging people to seek out imaginative ways to engage in their communities. It’s about demonstrating to the nation that by working together, we have the fortitude to meet our challenges and accomplish our goals. We're celebrating National Volunteer Week! First, we wanted to take a moment to highlight some of the amazing contributions of the Aquarium’s unpaid staff and highlight some opportunities for you to get involved. 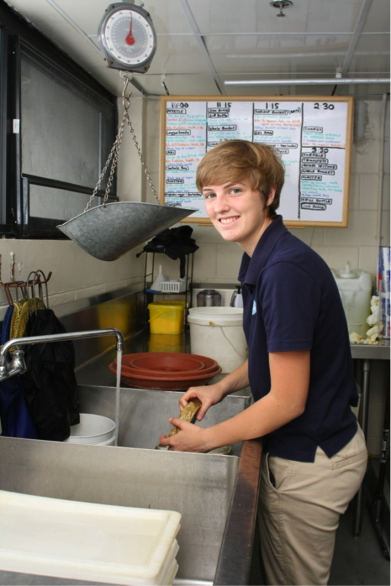 In 2013, our 938 adult Aquarium volunteers and interns hit an incredible milestone by donating over 100,000 hours towards our mission of protecting the blue planet. What did that many people spend so much time doing? Most of our volunteers and interns served in one of the following top three departments: Husbandry, Rescue and Rehabilitation and Visitor Education. When you have over 300 sea turtles to rehabilitate of in the course of a year, 192 volunteers and interns help get the work done—spending nearly 17,000 hours helping to ensure these animals can return healthy back into the wild. 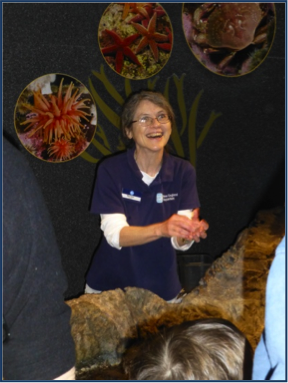 It’s certain that the last time you visited the Aquarium, one of the 106 trained volunteer interpreters helped make your experience meaningful (and they spent over 15,000 hours doing it). Here’s where we get to talk about the Volunteer department's volunteer! 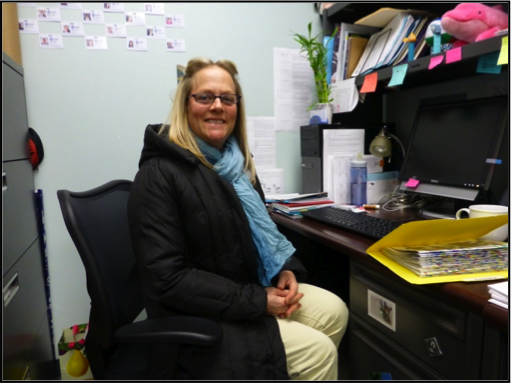 Whitney Tibolt served over 100 hours assisting the Office of Volunteer Programs and Internships with the data entry, filing and other office support that is helping us provide more impact reporting. She’s also helping us scan our files to electronic versions as we work to live blue! 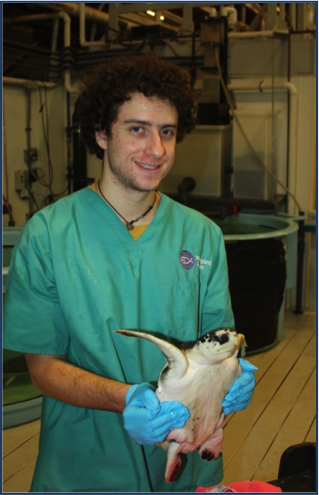 Alex Shopov was named Volunteer of the Month in August 2013 and a current member of the New England Aquarium Marathon Team. As an educator, Alex brought unique skills to the position as he was not only able to assist with medical tasks, but also could inform the public when helping out with tasks like performing a whale necropsy on the beach! He’s also a former penguin volunteer and has served over 800 hours during his time as a volunteer. Each of our individual volunteers and interns plays an integral part in the 100,000 hours served last year and we thank each and every one of them for their impact on protecting the blue planet. If you currently serve, either at the New England Aquarium or elsewhere throughout our community, we would like to thank you for your incredible donations of time, energy and passion. We know that it can be hard to take time out of our daily lives for the betterment of another, but each time you do our community is indebted to you! 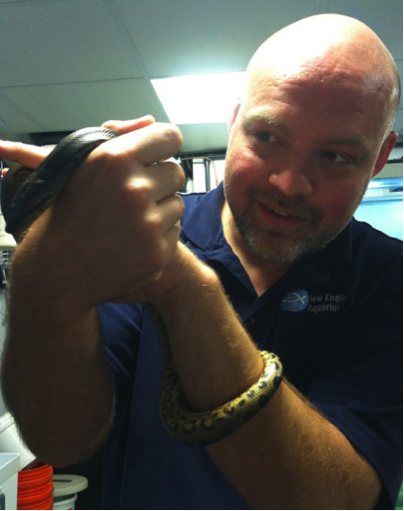 Become a regular volunteer with New England Aquarium and commit to serving with our animals, guests, community programs, or administrative roles. Need a more flexible commitment? Sign up to become a live blue™ Service Corp volunteer. Not in Boston, or interested in working with other kinds of animals? Find another AZA institution near you that needs volunteers. Consider a citizen science program like Frog Watch USA. Boston Cares has a fantastic calendar of click-to-sign-up service opportunities throughout Greater Boston focused on a diverse array of impact areas from homelessness to education. You can learn about national service initiatives and find a local volunteer action center by visiting HandsOn Network. Stay tuned for more posts celebrating National Volunteer Week!